Can anybody out there tell me what some hex bar deadlift benefits are? Well, most of you probably have never used a hex bar (trap bar), or if you have, maybe not for deadlifts. Everyone knows how awesome a hex bar can be for the farmer’s walk and shrugs — but what about deadlifting? If you are used to traditional deadlifting, then you probably haven’t even considered using a hex bar. Maybe some of you haven’t even used, seem, or heard of a hex bar! However, when using something like a hex bar, I must recommend our Dark Iron Fitness suede lifting straps. One thing I’ve noticed when doing hex bar deadlifts is that a lot of hex bars will have fairly aggressive knurling on the handles. What this means is though you can get a good grip, your hands may get tired from holding such powerful knurling. The use of lifting straps gives you a nice, comfortable surface to grip and allows you to focus on the movement instead of trying to hold on tight. But, the reality is, a hex bar is an awesome tool for weightlifting and bodybuilding — no question. In this article, we will tell you what a hex bar is, how it can be used, and its various benefits. To be more specific, we will be going over the 3 best reasons to start using a hex bar. Related: What Muscle Groups Do Deadlifts Work? What is a Hex (Trap) Bar? The hex bar is designed in a unique way. It is large, bulky, and both unconventional and inconvenient. But, the inconvenience is only due to its shape and size. Despite that, the hex bar is extremely useful. Usually, some of the most unconventional and different approaches are the best. In this case, the hex bar is no exception to that. Its shape is an elongated hexagon with Olympic sleeves on the ends and handles. Most hex bars will have two sets of handles, flat ones that are level and raised ones above the frame. Though it may be unconventional and different, that may be what you need. Even with its different and unconventional construction, the hex bar is logical. Well, for a lot of exercises, especially deadlifts, the hex bar is a logical choice. Instead of needing to use a mixed grip or pronated grip, you get something more natural. That is a neutral grip, to your sides, like you would use to lift two grocery bags. Also, the height of the handles compared to a standard barbell gives you more height from the ground. This allows you to be more comfortable and not need to get as low for your deadlift pull. Another great thing about the hex bar is that it is rugged and heavy-duty. Unlike a standard barbell, which could bend under heavy weight, the hex bar will be more resilient. With its more durable structure, the hex bar is something you’ll want to look into. I highly recommend it to everyone, but just based on its build, all you seasoned heavy lifters out there will love the hex bar. How Do You Deadlift with a Hex Bar? As I said, the hex bar’s construction makes deadlifting completely different. You will be holding the hex bar handles at your side and pull up the bar around you. Since the hexagon shape has an open center, you stand in the middle and pull the frame up to your hips. 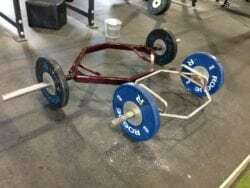 It’s definitely a new approach to deadlifting and strays from conventional and sumo deadlifts. But, variety is what keeps us sane, and the hex bar will help change up your deadlifting routine. Remember, deadlifting with the hex bar will be strange compared to what you’re used to. So, practice your form with this new setup and be aware of how the movement works. Of course, it is similar to your conventional deadlift in how you pull and lock the hips forward. However, the positioning of your hands, your starting stance, and range of motion will feel different. And again, with the knurling on the hex bar and the neutral grip, I’d recommend a few things to use for this deadlift. Implementing the use of these accessories and knowing proper form before starting will allow you to get the most hex bar deadlift benefits as possible. Do Hex Bar Deadlift Benefits Trump Conventional Deadlifts? The main differences between the hex bar deadlift and conventional deadlifts have to do with form and positioning, but we’ve talked about that enough! But, with these changes in setup, one of the best hex bar deadlift benefits is the comfort aspect. Your comfort level will be much higher and you’ll put less stress on your body, particularly your back. If anything, the conventional deadlift is more convenient due to the use of a barbell. Another huge difference is the lift being front-loaded vs side-loaded. With the hex bar, the weight is balanced to your sides, evenly, instead of positioned on a bar ahead of you. This makes the balance portion of the lift much more enjoyable. In the end, I think generally the hex bar deadlift benefits can be broken down into two categories. What I mean by introducing these categories is that some of these benefits are good but only good for certain times/reasons. The construction and frame of the hex bar are good for their ability to make a durable deadlift platform. Also, the bar should last a long time without any problems. But, this, in turn, makes it bad for storage, convenience and transporting. I can bring a straight barbell around the gym or my house with no problems — the hex bar is a little more daunting, if not annoying. Furthermore, using the hex bar as a platform for deadlifts helps to build up your strength and muscle, but it doesn’t prepare you much for other deadlifts. In my opinion, if you want to get good at conventional deadlifts then you should focus on that format and mix in things like stiff-legged deadlifts or sumo deadlifts. But, if you were to enter a powerlifting competition, I guarantee you won’t see a hex bar in sight. And, if you’ve been only deadlifting with a hex bar, it’ll be a problem trying to jump back to conventional deadlifts. The truth is, there are so many deadlift variations to choose from! Of course, I can go through and nitpick here and there about how some benefits are good in certain cases, while potentially negative in others — but let’s discuss the top 3 hex bar deadlift benefits and why they are so awesome. If you have a hex bar available to you at the gym or own one in your home, then you’re in luck! For beginners, who are starting to deadlift, the hex bar is a nice introduction to the movement and working those muscles. Also, for all of those lifters out there with back and shoulder injuries, the hex bar deadlift is more suited towards you. Mainly, your quads will be carrying most of the burden to help you complete the lift, whereas conventional deadlift will often have people straining their backs. So, if you feel that discomfort while doing conventional deadlifts, I suggest giving the hex bar deadlift an opportunity to grow on you. I promise you will enjoy the movement once you learn it and can progressively get better at adding weight. One of the better ways to promote strength gain and muscle growth is by varying your workouts. If you do the same routine every single day, you’ll plateau with that movement. No longer will your reach progressive overload and up the weight. What this results in is a loss of potential strength gains and dense muscle gains. To combat these plateaus and lack of progress, you need to keep your muscles guessing. Switch up your routines and practice alternative exercises to find your lifting sweet-spot. Going from daily conventional deadlifts to the occasional hex bar deadlift can help boost strength and muscle. And lastly, the benefit that I enjoy the most, is the ability to lift more weight and easily. Okay, maybe not that easy, but much easier than conventional. I think the biggest advantage that the hex bar has is its construction which leads to a change in leverage and ROM. With a shorter range of motion and a more balanced, straight up, straight down leverage, the hex bar feels superior to using a standard Olympic barbell. Out of these 6 sets of deadlifts, which was easiest? At first, maybe they felt similar and comparable. However, I can almost guarantee that your last set of 5 on the hex bar was easier than on the Olympic barbell. Another test to do would be continually adding more plates to both the hex bar and the Olympic barbell — with the same amount of plates on each, which deadlift feels easier and more comfortable when the weight gets heavier? Finding a hex bar to use will probably be your biggest obstacle in reaping these benefits. But, if one is available or you have the option to use it, why not? You can actually really optimize your deadlifting and target your body in a new way. Furthermore, you can perform deadlifts more comfortably and safely. If you want to make sure you get the most out of both the comfort and safety aspect, invest in our suede lifting straps. Trust me, the hex (trap) bar will change the way you look and experience several workouts. Whether it’s farmer’s walks, shrugs, bent over rows or deadlifts — there’s something in it for everyone.